﻿Alongside its main purpose of presenting undergraduate and doctoral students’ dissertation findings both on national and international level, Istanbul Journal of Innovation in Education (IJINE) is hospitable to all researchers working in the field of educational sciences. 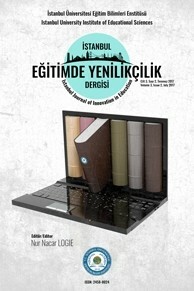 Featuring articles in Turkish and English, JINE is a peer-reviewed journal. Istanbul Journal of Innovation in Education (IJINE), published triannually by the Institute of Educational Sciences of İstanbul University since 2015, publishes original research and manuscripts of the highest quality from all areas of the educational sciences. IJINE aims to provide a platform for the dissemination of original research and studies in such domains of education as primary education, social studies education, science education and foreign language teaching produced by established scholars as well as postgraduate and PhD students. Special issues of IJINE also include innovative and interdisciplinary studies presented in educational symposiums, workshops and congresses. IJINE invites researchers and scholars to submit their original and unpublished work in the areas of education and teacher training for the 9th issue of our journal (volume 3- issue 3) until 31.03.2018 via journal's website. EĞİTİM, KÜLTÜR, ÖĞRETMEN; ÖĞRETMEN ODAKLI MI? ÖĞRENCİ ODAKLI MI?